Description of "Stories for Success"
Do this, don't do that and the chorus never ends... Isn't it irritating to be continuously corrected and advised? As most of us like listening to stories why not use stories to teach kids? 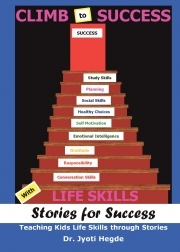 This book contains original stories that can be used by parents and teachers to teach kids good habits and life skills. Dr. Jyoti Hegde is a Corporate Behavioral Trainer and a Life Skills Trainer for students. Jyoti has a degree in Ayurvedic Medicine. She has over thirteen years of work experience in the medical field in various hospitals/medical centres in Bangalore and Goa. Jyoti has been personally trained and mentored in the field of behavioral training by Corporate Behavioral Trainer, Amey Hegde. Jyoti has also been trained by various master trainers to practice and implement international concepts of Positive Psychology, Facilitation Skills, and Neuro Linguistic Programming (NLP) in developing and conducting training programs. Jyoti is a co-creator of the Life Skills Diamond Model, a framework for holistic development of children. Jyoti's articles and stories related to child development appear in various newspapers and magazines and she also shares them on her blog http://jyotihegde.in/blog. Jyoti has co-conducted training sessions on various aspects of behavioral training for employees from reputed organizations like Vedanta, Funskool, The Leela Goa, Sun Pharma and many others. She has recently started CHAMPS, a year long programme on Life Skills and Personality Development for kids. Reviews of "Stories for Success"